There was a packed opening night at this new exhibition at the Focal Point Gallery in Southend on 16 April, and a great party atmosphere too. After decades of embarrassed silence, a rich history of political and religious non-conformism and radicalism in Essex is now being properly acknowledged, in a county that has been the subject of much cynical misrepresentation, but which is here revealed as a key social laboratory for all kinds of experiments in living in the 20th century. 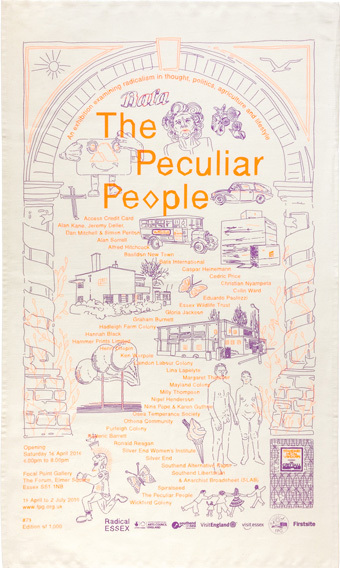 The exhibition title takes its name from a Nonconformist sect unique to Essex, The Peculiar People, about which we blogged earlier this year, and the gallery itself has been handsomely re-housed within the state of the art new public library, The Forum. The tutelary spirit of anarchist historian Colin Ward hovers over the exhibition, for it was Ward, latterly with Dennis Hardy, who initially chronicled the self-built plotland communities and rural communes to be found on the margins of Essex. Ward suggested that they arose there because of a relative proximity to London’s politically volatile East End, but also – following the agricultural depression of the 1870s – land was cheap. The ground plans of the Dunton colony near Laindon are on display, but also included is a rare opportunity to listen to a recording of Ward giving his 1985 lecture, Arcadia for All – A study of the Essex Plotlands. Close to Dunton, in East Tilbury, the Czech shoe manufacturer Tomas Bata established his model industrial village in 1932, having been persuaded by a local clergyman to come to the aid of the many unemployed in the area. At its peak, Bataville employed over 4,000 workers, many of whom lived in houses supplied by Bata, and designed in a modernist style. Workers were encouraged to participate in company leisure-time activities – outdoor swimming pool, tennis courts, 350-seat cinema and technical college – and even took ski-ing holidays in Czechoslovakia at the company’s resorts there. No zero-hours contracts then. ‘We are not afraid of the future’ was Bata’s maxim, and a selection of plans and drawings of his model town are on display, supported by documentary footage from a film by Karen Guthrie and Nina Pope. Along with Bataville, Silver End Garden Village near Witham was another attempt to build an industrial settlement as a utopian community (even if ordained from above, as both manifestly were). Established in 1926 by Francis Crittall (1860 – 1935), a successful manufacturer of metal window frames, the housing was designed in a high modernist style by architect Thomas Tait. The village was almost entirely self-sufficient, and at the time regarded as one of the healthiest settlements in Britain, and is still much visited by architecture students. The overlap between the socially minded and the religiously inspired was strong in the early 20th century, so it is not surprising that many of the religious settlements featured in the exhibition – Hadleigh Farm Colony, Osea Temperance Society, the Othona Community at Bradwell, among others – were centres for the rehabilitation of those whose lives had previously been blighted by poverty, ill-health, addiction, or as places of spiritual retreat. Wide-ranging as it is, the exhibition only scratches the surface of the dozens of self-sufficient or therapeutic communities established in Essex over the past hundred years, many of which remain unrecorded. The principal gallery space also includes the work of artists and architects who took a fancy to the Essex scene, possibly because of its rough and ready unfashionability. A large vitrine displays a model by architect Cedric Price for an unrealised 1972 proposal to construct an inflatable roof to cover Southend High Street, along with a number of Price’s bold and expressive drawings. Other exhibits include watercolours, drawings or prints by Edward Bawden, Nigel Henderson, Eduardo Paolozzi, Milly Thompson, along with a generous display of work by poet and artist Henri Chopin. The folk-modernist spirit of the old Southend Art College is captured in a display of books written and illustrated by Kurt Rowland, who taught at the college, and whose pioneering work in the field of design education became internationally renowned. Rowland may well have inspired the fanzines produced by the Southend Libertarian & Anarchist Broadsheet (SLAB) collective in the 1980s, a number of whom worked locally for HM Revenue & Customs, but, not unsurprisingly, contributed anonymously. Artist Christian Nyampeta completes the exhibition with his fashioning of Gallery 2 as a place for meeting, talking, reading and the exchange of views about the world, complete with striking murals, purpose-built furniture and book-shelves, all combining to create a small salon/library/retreat to which visitors can retire and reflect. The exhibition is just one element in a longer project being carried out by Focal Point Gallery under the rubric, ‘Radical Essex’, and includes architectural study tours across the county, gallery talks, and related projects such as Matthew Butcher’s ‘Flood House’, the subject of our last posting. It’s a small step for Essex but a large step for mankind.